PHILADELPHIA (BRAIN) — As of Oct. 1, exhibitor registration for the Philly Bike Expo is up 17 percent, and the annual trade and consumer festival has sold 250 percent more tickets than at the same time last year as this year's edition approaches on Oct. 27 and 28. OCEANSIDE, Calif. (BRAIN) — Race Across America (RAAM) will hold its first consumer festival at the start of the team race at Oceanside Pier in San Diego County on Saturday, June 16. DENVER (BRAIN) — Several of Colorado's largest and longest standing bike events are being operated by new owners this season. The late September festival in Colorado is expanding its demo and its enduro, and adding a gravel grinder and e-bike event. VAIL, Colo. (BRAIN) — Organizers of the Outlier Offroad Festival have announced additions for the event, which is scheduled for Sept. 28-30 this year. NEW YORK (BRAIN) — Less than a month before the event, Bike New York has announced that it will move Bike Expo New York to Pier 12 in Brooklyn. Due to unexpected maintenance, the nonprofit was unable to obtain a permit to hold the event at Basketball City, where the event has taken place for the last six years. 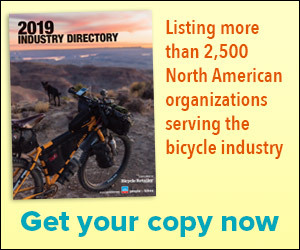 BOULDER, Colo. (BRAIN) — The International Mountain Bicycling Association will host a new event to bring together female leaders in mountain biking. The IMBA UPRISING event will be March 22-25 in Bentonville, Arkansas. The first Sagan Fondo, in the Lake Tahoe area in May, will include gravel and dirt roads. SANTA ROSA, Calif. (BRAIN) — Three-time world champion Peter Sagan is working with Bike Monkey, the producer of Levi's GranFondo, to promote two new gran fondo events in California this year.